Born Horncastle, England, June 19, 1783. Died Philadelphia, November 5, 1872. 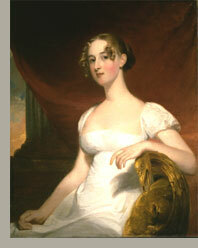 Thomas Sully is best remembered for his portraits of women (fig. 1). As the magazine Godeys Ladys Book proclaimed in 1844, "Sully, as all the world knows, paints exquisitely beautiful portraits of ladies. His praise is in all the parlours. "1As an artist, he recommended "flatterynothing so sure of success as flattering your portraits. "2 During his seventy-year career, he executed more than twenty-six hundred paintings, of which more than two thousand were portraits.3 In addition to depicting fashionable men and women and completing grand public portrayals of politicians, military heroes, and popular actors, Sully painted subjects from history (fig. 2), literature, and religion; landscapes; and what he called "fancy pictures" of young women, children, and pets. His penchant for record keeping, in the form of journals, notes, and accounts of his pictures, resulted in a wealth of information about his career. Figure 1. Thomas Sully, Margaret Siddons Kintzing (Mrs. Benjamin Kintzing), 1812, oil on canvas, 36 1/16 x 29 1/16 in. (91.6 x 73.8 cm), Worcester Art Museum, Museum purchase, 1917.35. Figure 2. Thomas Sully, Capture of Major André, 1812, oil on canvas, 22 3/8 x 30 1/8 in. (56.8 x 77.1 cm), Worcester Art Museum, Gift of Andrew J. Bates II, 1991.113. Figure 3. 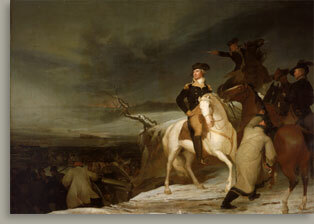 Thomas Sully, George Frederick Cooke as Richard III, 1811, oil on canvas, 94 7/8 x 60 1/2 in. (241.0 x 153.7 cm), Courtesy of the Pennsylvania Academy of the Fine Arts, Gift of friends and admirers of the artist, 1812.1. Like other artists of his day, Thomas Sully probably aspired to paint a greater number of historical paintings but realized that portrait commissions would support his family. After he was elected an Academician of the Pennsylvania Academy of the Fine Arts, in 1812, Sully submitted to that institution his copy after Peter Paul Rubenss Tribute Money (about 161112, Fine Arts Museums of San Francisco) as the required example of his art.52 On December 21 that year, he noted in his journal that his "copy of Opies Gil Blasssold to Academy F.A. "53 Because Sullys interest in history painting extended beyond copies by other artists, he advertised himself as a "Historical and Portrait Painter" in catalogues for the annual exhibitions at the Pennsylvania Academy.54His friend and fellow portraitist Jacob Eichholtz (17761842), who recognized Sullys desire to paint historical subjects, expressed in an 1817 letter the hope that Sullys "historical powers will now be called into action." Figure 4. Thomas Sully, Passage of the Delaware, 1819, oil on canvas, 146 1/2 x 207 in. (372.1 x 525.8 cm), Museum of Fine Arts, Boston, Gift of the owners of the Old Boston Museum. Courtesy, Museum of Fine Arts, Boston. Reproduced with permission. © 2000 Museum of Fine Arts, Boston. All Rights Reserved. His interest in the cultural life of Philadelphia extended to music and theater. At Sullys death, one local reporter noted that in addition to ranking among "the best American painters," he "was a musician of no small ability. "74 He owned a pianoforte, which he had purchased in 1815.75 In 1817 he painted one portrait in exchange for a flute and another to cover tuition for his daughter Janes music lessons.76 He was a charter member of the Musical Fund Society of Philadelphia and was elected a director of music at its first formal meeting in 1820. Sully attended Musical Fund Society concerts and lectures and served as its vice-president from 1860 to 1873.77 And not surprisingly, this son of actors, who also painted portraits of actors, was an avid playgoer. Finally, Sully was a teacher. In August 1819, The Port Folio reported that he had consented "to direct the studies of gentlemen desirous of becoming professional artists, has made an arrangement to accommodate those who may address him on the subject. His terms may be learned on application at his rooms, adjoining the Athenaeum. "92 He taught his own children, his nephew Robert Matthew Sully (18031855), and his son-in-law John Neagle (17961865), as well as the painters Charles Robert Leslie (17941859) and Jacob Eichholtz, among many others. He frequently listed names of students in his journal, including Douglass, "a coloured boy," whose good work prompted the artist to "continue to lend him assistance. "93 Occasionally, Sully found himself with too many students, as in August 1825, when he wrote, "Students of painting multiply. "94 In September 1833, he recorded in his journal that from then on he would "adopt a plan of charging for instruction." 1. Visit to the Painters 1844, 277. 2. Sullys "Journal," April 14, 1833, 92. See also Sullys "Hints for Pictures," November 1850, frame 213. 3. There is no accurate tally of Sullys portraits, since the artist did not record them in his "Account of Pictures." See Fabian 1983, 23 n 30. 5. Sullys "Journal," September 27, 1799, 1. 6. See Sullys "Account of Pictures." 7. Hart 1908, 399, no. 44. 8. Sullys "Journal," September 1804, 4. 10. Sullys "Journal," December 16, 1806, 5. 11. Ibid., July 5 and 25, 1807, 67. 12. Ibid., July 28, 1807, 7. 13. Sully 1869, 70; Dunlap 1918, II, 25051. 14. Sullys "Account of Pictures," frame 10. 15. Sullys "Journal," February 1808, 8. 16. Ibid., July 14, 1808, 9. 17. Charles Willson Peale, Philadelphia, to Rembrandt Peale, Paris, June 26 and July 3, 1808, as quoted in Miller 1988, 1094. See also Sullys "Journal," September 9, 1808, 9. 18. Charles Willson Peale, Philadelphia, to Rembrandt Peale, Paris, September 11, 1808, as quoted in Miller 1988, 1139. 19. Sullys "Journal," June 9, 1809, 1011. 20. Ibid., July 24, 1809, 11. 22. Sullys "Journal," July 24, 1809, 11. See also Evans 1980, 15156. His notes contain numerous observations about Lawrences work and techniques. See Sullys "Hints for Pictures," frames 78, 80, 9798, 105, 132, and 133. His Mrs. Hughes (about 1830, Metropolitan Museum of Art, New York) is based on Lawrences Julia, Lady Peel (1827, Frick Collection, New York). Before painting Mrs. Hughes, Sully did an ink-and-wash copy of the Englishmans portrait (private collection). See Bedford Gallery 1973, 17. 23. For a record of price increases up to 1851, see Sullys "Hints for Pictures," November 5, 1835, frames 13940, and November 15, 1851, frames 21920. 24. United States Gazette (Philadelphia), October 2, 1812. See also Johns 1983. For the Cooke portrait and its impact, see Quick 1981, 128. 25. Fabian 1983, 20, 73; Sullys "Journal," June 22, 1812, 14. 26. Charles Willson Peale, Germantown, Pennsylvania, to Benjamin West, London, September 11, 1815, as quoted in Miller 1991, 358. 27. Sullys "Account of Pictures," 1815, frame 19. 28. Sullys "Journal," April 1806, 5, and August 1811, 14. 29. Ibid., June 9, 1809, 10. 30. Ibid., December 11, 1836, 114. This was not a new problem, but it appears to have worsened over time. 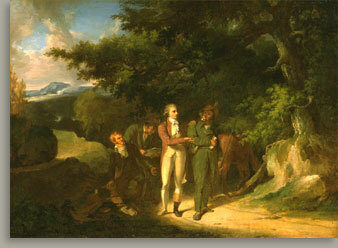 For instance, in May 1813 several gentlemen purchased George Frederick Cooke as Richard III and presented it to the Pennsylvania Academy of the Fine Arts. However, at the end of 1816, Sully noted that the subscribers had even by then not finished paying for the work. See Sullys "Journal," Review of the Concerns for the Year 1816, 20. 31. Sullys "Journal," December 13, 1842, 256. For his prices in 1837, see Sullys "Hints for Pictures," March 1, 1837, frame 140. 32. Ibid., November 20, December 9, 14, and 16, 1843, 26970. 33. Ibid., November 26, 1840, 229. 34. Ibid., May 3, 1841, 235. According to Joseph Sill, Sully had hoped to sell the Washington portrait to the state of North Carolina. See Excerpts from the Diaries of Joseph Sill, November 26, 1842, Archives of American Art, Smithsonian Institution, Washington, D.C. (hereafter cited as AAA), microfilm reel P29, frames 33233. 35. Visit to the Painters 1844, 27778; Sullys "Journal," November 28, 1842, 256. At the end of the year, this portrait was listed among pictures not sold; it was valued at $2,000. Sullys "Journal," Review of the Concerns for the Year 1842, 257. 37. Sullys "Journal," March 10, 1840, 214. On April 14, 1833, Sully had noted, "Last Monday retouched the likeness I formerly painted of Mrs. Skinnermiserably thin of colour and deficient of impasting." Sullys "Journal," April 14, 1833, 92. 38. On August 19, 1840, Sully wrote, "[R]etouched the portrait of Mrs. Wallace. Binney suggests a sitting from Mrs. Wallace to give it the air of an original." On August 30, Mrs. Wallace sat for her retouching. See Sullys "Journal," August 30, 1840, 225. 39. See, for instance, Sullys "Journal," April 29, 1815, 18. 40. See Thomas Sully notebooks, 180971, General Collection, Beinecke Rare Book and Manuscript Library, Yale University; and Prown 1964. 41. Sullys "Journal," December 12, 1840, 230. 42. Charleston Courier, November 27, 1841, as quoted in Rutledge 1949, 163. 43. Sullys "Journal," June 22, 1828, 60. 44. Fabian 1983, 16, 9499. 45. Sullys "Journal," September 26, 1837, 120. 46. Ibid., January 18, 1829, 66. 47. Pennsylvania Academy of the Fine Arts 1812, 18. 49. Pennsylvania Academy of the Fine Arts 1814, 18. 50. For Murrays engraving after Sullys design "So long have we been mated, fell Despair! +c.," see The Port Folio 7, no. 6 (June 1819): frontispiece. 51. Thomas Sully, Philadelphia, to Asher B. Durand, March 21, 1825, Charles Henry Hart Autograph Collection, AAA, microfilm reel D5, frame 299. 52. Thomas Sully to the Directors of the Pennsylvania Academy of the Fine Arts, July 8, 1814, correspondence, documents, rough minutes etc., of the Pennsylvania Academy of the Fine Arts, AAA, microfilm reel P63, frame 373. 53. Sullys "Journal," December 21, 1812, 15. 54. Pennsylvania Academy of the Fine Arts 1812, 30. Sully listed himself this way in the Academys exhibition catalogues as late as 1829. See Biddle and Fielding 1921, 28. 55. Jacob Eichholtz, Lancaster, Pa., to Thomas Sully, Philadelphia, January 19, 1817, Dreer Collection of Painters and Engravers, Historical Society of Pennsylvania, AAA, microfilm reel 20, frame 465. 56. Visit to the Painters 1844, 277. 57. Thomas Sully, February 20, 1817, to Daniel Peck, Esq., as quoted in Fehl 1973, 596. 58. For Passage of the Delaware, see Sullys "Journal," December 15, 1819, 23; May 20, 1822, 26; February 11, 1823, 28; Review of the Concerns for the Year 1824, 34; and August 22, 69d. See also Philadelphia Inquirer, November 6, 1872. 59. Sullys "Journal," June 16, 1827, 49. 60. James B. Longacre, Philadelphia, to John F. Watson, Esq., November 21, 1826, Historical Society of Pennsylvania, AAA, microfilm reel P28, frame 904. 61. Sullys "Journal," September 29, 1828, 63. 62. Ibid., April 16, 1830, 75. 63. See "Thomas Sully, Esq.," New-York Mirror, A Weekly Journal, Devoted to Literature and the Fine Arts 15, no. 22 (November 25, 1837): 174. I thank Ann Uhry Abrams for bringing this reference to my attention. 64. Sullys "Journal," June 25, 1836, 112. 65. New-York Mirror, A Weekly Journal, Devoted to Literature and the Fine Arts 12, no. 31 (January 31, 1835): 247. I thank Mark Thistlethwaite for bringing this reference to my attention. 66. Sullys "Journal," October 22, 1842, 255. 68. As secretary of the Committee of Correspondence for the Society of Artists of the United States, Sully wrote to Thomas Jefferson to inform him that he had been elected an honorary member of the organization. See Thomas Sully, Philadelphia, to Thomas Jefferson, December 22, 1811, Thomas Jefferson Papers, Massachusetts Historical Society (hereafter cited as MHS), P-060, microfilm reel 7. 69. For a list of works Sully exhibited, see Rutledge 1955, 21925. 70. Pennsylvania Academy of the Fine Arts 1811, 5. The annual exhibitions were publicized in the local newspapers. See, for example, United States Gazette (Philadelphia), April 4, May 11, and June 16, 1812. 71. Graves VII, 1972, 302. 72. Perkins and Gavin 1980, 138. 73. Fabian 1983, 20; National Academy of Design 1943, II, 14546; idem, 1973, II, 905. 74. "Obituary. Thomas Sully," Philadelphia Inquirer, November 6, 1872. 75. Sullys "Journal," Review of the Concerns for the Year 1815, 19. 76. Ibid., April and August 1817, 20. 77. Maggie Kruesi, Department of Special Collections, Van Pelt-Dietrich Library Center, University of Pennsylvania, to Laura K. Mills, November 2, 1999. See also Madeira 1896, 58, 60; and Sullys "Journal," February 25, 1839, 197; March 26, 1840, 215; May 19, 1841, 235; and June 19, 1843, 265. 78. See gallery-opening announcement in "The Fine Arts," The Port Folio 8, no. 2 (August 1819): 164. 79. Sullys "Journal," January 3, 1809, 9. 80. Ibid., May 8, 1817, 20. 81. Paxtons Philadelphia Directory, 1818, as quoted in Prime II, 1932, 31. 82. Sullys "Journal," March 19, 1818, 21. 83. James McMurtrie, Philadelphia, to Washington Allston, Boston, May 16, 1819, Dana Family Papers, MHS, box 55; Sullys "Journal," Review of the Concerns of the Year 1825, 39, and April 10, 1831, 81. 84. Sullys "Journal," May 18, 1824, 31. 85. Ibid., January 7, 1827, 46. 86. Ibid., December 3, 1837, 127. 87. Ibid., November 20, 1837, 124, and June 11, 1838, 170. 88. Sullys "Hints for Pictures," April 23, 1809, frame 76. 89. Ibid., July 7, 1826, frame 108. 90. Ibid., frames, 77, 78, 79, 96, 108, 140, and 143. 91. Sully 1873. See also Thomas Sully notebooks, 180971, General Collection, Beinecke Rare Book and Manuscript Library, Yale University; and "Private Memorandum," Thomas Sully, 183759, leather-bound manuscript, Joseph Downs Collection of Manuscripts and Printed Ephemera, Henry Francis du Pont Winterthur Museum. 92. "The Fine Arts," The Port Folio 8, no. 2 (August 1819): 164. 93. Sullys "Journal," March 16, 1829, 67. 94. Ibid., August 4, 1825, 36. 95. Ibid., September 1, 1833, 94. 96. For the "Sully Fund," see Goodyear 1976, 29. 97. Sullys "Account of Pictures," 1871, frame 74; idem, November 26, 1840, 229. 98. "Obituary. Thomas Sully," Philadelphia Public Ledger, November 6, 1872. 99. He was buried in lot 41, section A, lot 41. Mary Ann Piechoski, Laurel Hill Cemetery Company, Philadelphia, to Laura K. Mills, November 26, 1999.